It’s been my first week back at my job as a peripatetic teacher this week. I’ve been doing this job for 12 years now – I can’t quite believe it’s been that long. It feels different this year though because I’m only working 2 days a week, so technically I have more days as a poet than I do as a music teacher. Last week I only actually did 1 day of teaching because I was away for a kind of training day for a new exciting project that I’m not allowed to say anything about. So I’d better not – but that day away made it seem like the week went by very fast. The rest of my week was made up of the usual mix of random things – a meeting with Pauline Yarwood about Kendal Poetry Festival, which we’re slowly starting to put together. We’ve managed to secure a venue for the festival, which is going to take place at Abbott Hall Art Gallery, hopefully in June next year. We’re now at the stage of finalising a first application for funding. It is a load of hard work putting a festival together! That might sound really obvious, but I didn’t realise how hard it was until we started. It still feels very much like an uphill struggle at the moment, and we both have to keep telling each other that we are making progress. We’ve got a draft programme, a venue and a nearly completed funding application so we are on our way! I also drove to Preston with Mrs A to pick up a baby Eb Bass for the junior band which someone was selling on Facebook. While we were there, I also bought a tenor horn as well – always a useful thing to have in the cupboard! On Wednesday I took part in the Ulverston 5k and ran round with my friend Ian, who would usually be too fast for me to keep up with. However he has took it upon himself this week to do some DIY and managed to stand on a nail which has slowed him down a bit, so he agreed to pace me round the course. My best time for 5k, on the same course last year was 22 minutes and 54 seconds, so I thought a sensible time to go for would be 22 and a half minutes. Ian had other ideas however. Anyway, that little effort put me completely out of action for the next day and I spent most of it in the garden, lying on my hammock. I was quite relieved it was my day off and I decided to not do any writing but just to spend the whole day reading. I actually fell asleep in the hammock and only woke up because the dogs ran out barking at a cat that was peering over the fence. On Thursday night I went for another run (probably foolishly – but routines must be upheld) and then went to quintet rehearsal. The other thing that happened this week is the quintet I run – the South Lakes Brass Ensemble were booked to play at a 30th anniversary dinner at the Coronation Hall. We only had a couple of days notice as the people who booked us to play had been let down at the last minute, so I was pleased with how the gig went. On Friday, I was running Dove Cottage Young Poets and then I went straight from there to Settle, where I was due to be reading that night with Meg Peacocke. Traffic coming out of Kendal meant I was late arriving to the organiser’s house who had made lovely soup and laid out salad and bread and cheese and all sorts of lovely things, but I did manage to scoff some food. Reading with Meg was lovely and the audience were really welcoming and friendly. I managed to sell 8 copies of The Art of Falling and two If We Could Speak Like Wolves which I thought was good going. I read from a lot of new poems in the second half, and in retrospect, I think that might have been a mistake. I think next time, when I have two 20 minute sets, it would be better to mix the new poems up with the poems from the book. The poems from the book can act as the scaffold then, to hold the new poems steady. You live and you learn though! Today I’ve been for a 15 kilometre run. I’m trying to get one long run in each week in preparation for the Lancaster Half Marathon which I’m doing the first weekend in November. If I manage it, it will be the first half marathon that I’ve done with a few long runs in the bag before hand and I’m hoping this will translate into an improved time. Last year I ran 1 hour 52 minutes – this year I’d love to get as close to 1 hour 45 minutes as possible, although that seems like an impossible task, to take seven minutes off. A few reviews are starting to come in for The Art of Falling. David Cooke has reviewed my book alongside collections by William Bedford and Patricia McCarthy in the recent issue of The North. Matthew Stewart has also written a really perceptive and generous review over on his blog Rogue Strands. There will be a review essay about the book appearing in the next issue of Poetry Salzburg and they have also taken a new poem to publish alongside the essay – the first one I’ve had published since the collection came out. This is my own lazy fault, as I have been hoarding poems instead of submitting them. I’m feeling quite lazy at the minute. Although it doesn’t sound like it when I list what I’ve been doing, I’ve actually spent a bit more time this week deliberately resting. I am prone when I’ve been ill to getting post-viral fatigue syndrome, so after the cold I’ve had I’ve been trying to take it a bit easier. I know running 15k isn’t taking it easier, but I’ve been doing the minimum amount of emailing I can get away with. I’ve also been trying to keep away from social media a little bit. I’ve been posting on Facebook and Twitter probably just as much as usual, but I’ve been trying to stop wasting so much time scrolling down newsfeeds. I must admit, I decided to do this after reading Anthony Wilson’s blog – at the minute he has taken himself off Twitter. I don’t want to come off completely, but I remember when I was younger, I used to walk around the house with a book in front of my face reading. The last thing I did at night before I went to sleep would be to read. Now, the last thing I do is check Facebook and Twitter. So I’d like to get back to reading more. Plus, my shelf of books that I haven’t read yet is getting seriously crowded and I’m getting further and further behind. Which leads me nicely onto the Sunday Poem for this week, which is by my good friend Mark Carson. I’ve been friends with Mark for as long as I’ve been writing. I don’t quite know how many years that will be now but Mark was at the first writing group, Fourth Monday Poets that I pitched up at. We are now in two writing groups together – Barrow Writers and Brewery Poets. He is also on the committee for A Poem and a Pint, taking on the least popular job of treasurer. Mark is a lovely man – very kind and generous with a great sense of humour. He has spent many, many years supporting other people with their work, including me, and I have never heard him be anything but enthusiastic and pleased at the news of other people’s success – and he really means it – he isn’t pretending! He travels widely to attend readings in Cumbria and Lancaster, again to support other people’s readings, but he is also a very good poet. He has been working quietly away at his poetry, sending submissions out and resending them if they come back without fuss or complaint. He works hard at his writing but he is not the type of person to write a blog about it! Luckily he has me to fill that gap for him! He has been on the blog before, and I’m sure I said similar things that time too – but this time Mark has a pamphlet out with Mike Barlow’s Wayleave Press. The press has been going a year and Mike has already published some fantastic pamphlets but I was really pleased when I heard Mark was going to have his own pamphlet out. 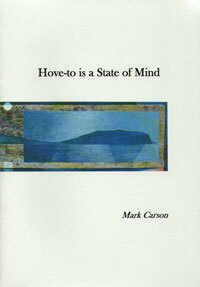 Mark’s pamphlet is called Hove-to is a State of Mind and the poems draw on his Irish roots, a career as an ocean engineer and time spent in Africa. Mark also told me some interesting facts about the pamphlet, which might be of interest to those people putting together their own pamphlet. One of the poems, Per Ardua ad Nauseam, dates back from 1980 (here is that hard work thing I’ve been talking about). One of the poems collected 18 rejections before finally being published (here’s that hard work again). Mark’s poems have been published in various poetry magazines – I can’t tell you which ones because he has been very modest in his biography and not listed them but I know one of the magazines he’s appeared in is Other Poetry. He’s also done well in competitions – a commended in The Troubadour Competition in 2011 and the poem I’ve chosen for the blog this week ‘Donegal’ was longlisted in the 2013 National Poetry Competition. I’ve always loved this poem, since the first time I heard Mark read it. He evokes the place very powerfully, with those details that tumble after each other – the ‘crunching’ of the shingle, the light as it ‘bleeds into dark’ and the ‘thin wedges of cloud’. These are all lovely, sensuous lines, but this is not just a poem about place. It has a real mystery – we don’t know why the ‘I’ is walking the beach ‘for the last time’. We don’t know why the ‘I’ is leaving. This poem has a real loneliness, or a sense of the outsider to it. That lovely word ‘sneck’ and the yellow light from the cottage make the cottage seem like a warm, inviting place, that is until we get to the last line of the second stanza and the reference to the people inside ‘murmuring’ secrets. The last stanza though is the strangest – again the vocabulary is really rich – lots of lovely words – ‘curragh’ and ‘kelp’ and ‘bladderwrack’. And the mystery of this stanza – why does he need a ‘wet brown cow’. Where is he going? Born in Belfast and educated in Dublin, Mark Carson went to Cambridge to do a PhD – Corrugation and the Dynamics of Rolling Contact –­ which should have led to a career in railway engineering. Instead he joined the National Institute of Oceanography, giving engineering support to geophysicists, marine biologists and meteorologists, and spending quite a lot of time at sea. Later he went to Nairobi University as a teacher of engineering, only to return to Cumbria where he co-founded an offshore engineering software business, Orcina Ltd. I hope you enjoy the poem, and if you would like to order Mark’s pamphlet you can order it here, direct from the publisher. Mark is also available for readings – get in touch with him through his publisher. He enjoys performing and he is a great reader of his work and very good company! Mark will be launching his pamphlet at Ford Park, Ulverston on the 8th October at 7.30pm. There will also be music from Braddyll Friends and the South Lakes Brass Ensemble! What’s not to like? thin wedges of cloud are nudging into the west. leaks secrets I don’t wish to know across inlets. and a wet brown cow with a bucket of kelp and bladderwrack. and the oar’s creak will blend with the wingbeat of swans.